We will run 32 extensive tests on your website to see how your products and services are represented on the web as compared to your competitors. Let us identify the business listings you have, the listings you need corrected and the listings you need created with our extensive local seo report! Take a proactive role in your online reputation. We’re offering a free report to help you determine where your business ranks in reviews. Our hunger for digital media has grown by 4 percent over the past year with the average person spending 5.9 hours per day on devices like our smartphones and desktop computers. Mobile media has also reached new heights with our mobile media consumption reaching 3.3 hours per day. The report found that Internet advertising spend in the United States has grown by 21 percent. As mobile usage increases, it’s expected that budgets for mobile advertising will rise to match. As voice technology matures, our adoption of products like Amazon Echo has grown. As the report highlights, Google Machine Learning Word Accuracy is now accurate 95 percent of the time, which explains why we are more willing to place our trust in voice search. Daily mobile video views are increasing by leaps and bounds. It is projected that by the end of 2018 the average user will spend approximately 35 minutes a day watching video content from a mobile device. Amazon came out on top for product discovery and research, but that doesn’t mean that SEO and PPC don’t have a place in Internet marketing. According to the report, while 49 percent of users start their product search on Amazon, 36 percent begin the process of finding a product through a search engine. 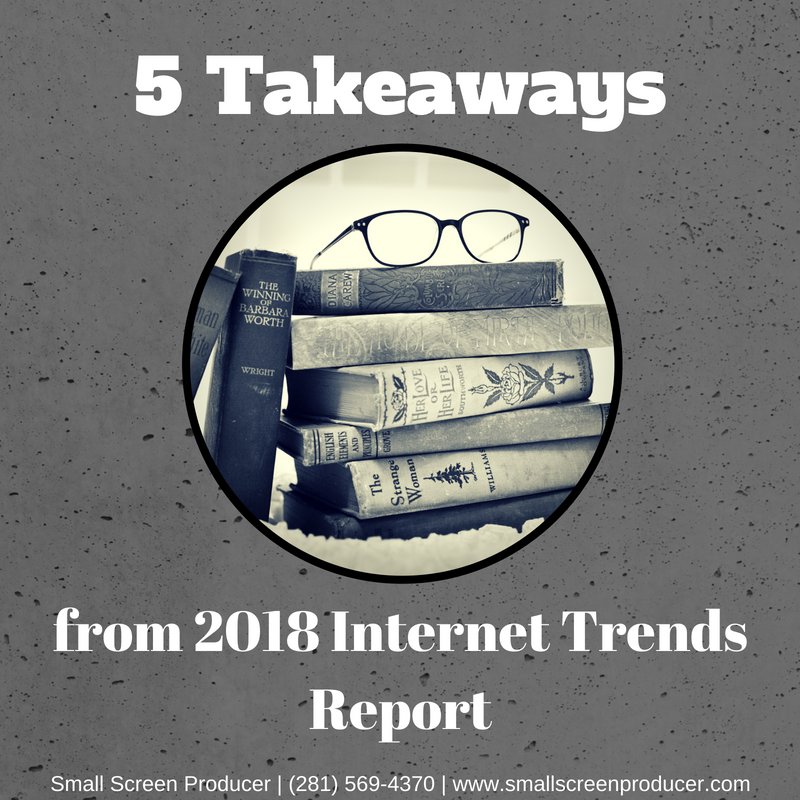 Take advantage of these FREE reports today or speak to an Internet trend and marketing expert at Small Screen Producer by calling (281) 569-4370. Why Does My Business Need Google Adwords? © Copyright 2019 Small Screen Producer. Not Sure What You Need or Where to Begin?